If only the British colonial ruler had known how his best of intentions would be misused, abused and over-used in both ways and more, after he had left these shores, he would have non-use of the term a pre-condition for granting Independence. There have been many occasions, in personal, private and public lives of individuals and institutions where the word ‘Sorry’ has saved the day. There have been more occasions in which the use, abuse and misuse of the word has made the very use laughable at times and highly condemnable otherwise. No marks for guessing where Field Marshal Sarath Fonseka’s expression of ‘regret’ to President Maithripala Sirisena would fit in, in this broad-spectrum application of the word. Maybe he actually used the word ‘Sorry’, maybe he did not, and it’s in the domain of private confidentiality and away from the public domain, at least until one of them, or anyone else present on the occasion spoke up. Yet, what he did say in the public domain earlier, requiring his subsequent expression of ‘regret’ to the Head of State, shows up only the sorry state of affairs to which public life in the country has sunk. 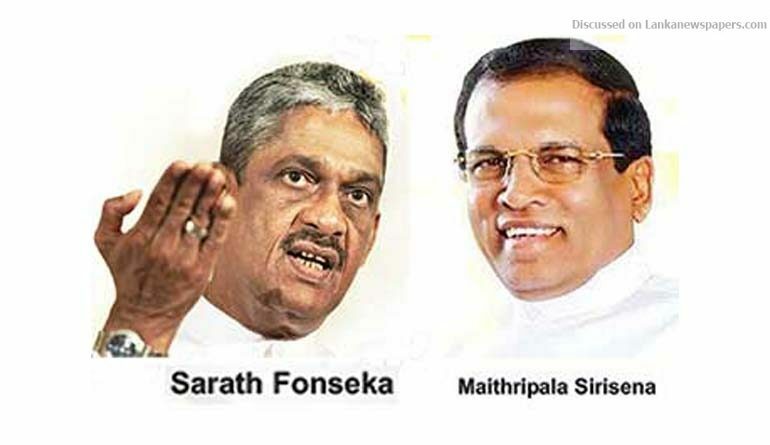 It is not about the politics of Fonseka opening up from nowhere to contest the decision of the UNP to field Sirisena as the ‘common Opposition candidate’ in Elections-2015, against incumbent Mahinda Rajapaksa. In the event, Sirisena won, and Fonseka is at present a Cabinet Minister in the very same Government, with the former as the Head of State, Head of Government and the Head of the Cabinet, all rolled into one. As a former Army Commander and also the nation’s only Field Marshal thus far, Fonseka would not have also forgotten that as President, Sirisena is also the Supreme Commander of the Armed Forces. Speaking out of turn is not new for Fonseka, whatever the post he may be holding at a given point in time. As the army commander at the height of ‘Eelam War IV’, Fonseka was reported to have said that “Sri Lanka belongs to the Sinhalese but minorities can live without making undue demands” – or, words and phrases to the effect. Later within days/weeks of the war victory, when the world was expecting Sri Lanka to roll-down on army intake, Fonseka, suo moto, declared that they would be going in for fresh recruitments each year, so as to double the existing strength of 200,00 uniformed men in a short span. Rather than getting drowned in the cacophony of war-victory against the unbeatable LTTE, which the international community too celebrated in private, such observations from Fonseka was enough to stir up additional cause for concern in western capitals. Worse still, none would trust his then masters-turned-foes in the Rajapaksas, when they sought to explain away his observations as ‘unauthorised’ and without truth and substance. More recently after becoming a Cabinet rank Minister in the current Government, Fonseka went on to declare that he had no problem with any probe into the ‘war crimes charge’ against the nation’s armed forces, nor would he mind deposing before any such panel. No one really took any serious note of it, but then, the first declaration should have owed to a policy decision of the Government, not otherwise. Whatever personal opinion that Fonseka might have had at the time, and even possibly later, he could have expressed in the Cabinet, and not in public. As a Minister in the Government, he would have been bound by the decision of the Cabinet, and hence the Government. On the question of deposing before any probe of the kind indicated, he could well choose to do so, as an individual. Whether he could continue to do so even while serving as a Cabinet Minister would have been for others to decide. This apart, there was/is a crucial difference between any such deposition made by an ordinary citizen, or even a uniformed person from the battle-front. It would have been much different in the case of the army commander, who was a leading member of the high-level National Security Council (NSC) strategising on the war as a whole, discussing tactical moves on the battle-front, and of course the diplomatic pow-vow that the political leadership might have discussed, with adequate inputs from those who were similarly qualified to offer such advice. These are ‘State secrets’ of a certain kind, and are often covered by the Official Secrets Act in almost every case. One thus only hoped that later-day Field Marshal Fonseka would have given a clear thought to it all when he said what he said about the war, the larger ethnic issue, which was a socio-political matter outside of the army commander’s domain, and later on, regarding the war-crime probe. It was sad that for things that he might had said and did, or did not say and did not do, the Rajapaksas thought it fit to haul up Fonseka so very unceremoniously over the coals. He was imprisoned, tried and condemned for wrong-doing, which had nothing whatsoever to do with ‘war crimes’ or any other conduct of his pertaining directly to the conduct of the war – if at all. The worse condemnation and humiliation for a serving officer and gentleman should be his cashiering from service. Fonseka faced this and more, and the nation, including his present-day political allies and masters watched it all in silence without doing, or wanting to do anything about it. Yet, when their turn did come, they did restore his honour and dignity, and added the greatest of them all by conferring on him the unique rank of ‘Field Marshal’. The UNP also adopted him as their National List MP, and later a Minister. Now, it would look as if UNP Prime Minister Ranil Wickremesinghe seemed to have concluded that it would be better to have Fonseka ‘inside’ rather than letting him loose ‘outside’. Maybe, that was also why Ranil and the rest had talked Fonseka into accepting the offer of becoming the ‘common Opposition candidate’ against the very same Rajapaksa in post-war Elections-2010, which the latter however swept through. It would be undignified and cheap to say that Fonseka ticked off Sirisena’s choice in 2015 (because) the latter had defeated incumbent President Mahinda R when he himself had failed full five years earlier. It would be even more uncharitable to claim that Sirisena the commoner achieved what the war-hero in Fonseka could not do, and hence the recent tirade. Yet, there was/is a larger message in it. Both Mahinda and Fonseka were ‘war heroes’ in their own spheres, but when it came to electing a President under the Constitution, the Sri Lankan voters (going beyond the narrow ‘Sinhala confines’) went in for the non-uniformed, public figure. When the contest was between two politicos in 2015, the very same voter had put the war behind! Even in 2015, the voter might have put Fonseka’s humiliation behind. But definitely he did not forget the unceremonious and uncalled for impeachment of Chief Justice Shirani Bhandaranayaka. The new dispensation did restore her honour, too, by recalling her as Chief Justice, even if for a single day. But then, in preferring Sirisena to Rajapaksa in 2015, the voter (going beyond the ideologically-tuned ‘minorities’, especially the Tamils), the voter did possibly draw the distinction between the discipline attaching to the uniformed services and the respect that he expected the political leadership to extend to civilian constitutional institutions like the Judiciary. Whether it has worked wonders on other areas of governance is a different thing, but in this one department, the difference became palpable and continual from day one to this very day. When some sections within the UNP reportedly propped up Fonseka for Law and Order Minister recently, some claimed that President Sirisena certainly and PM Ranil possibly had reservations about it – and even more so, some top cops who would be reporting to the Field Marshal in his would-have-been job. There may be more than one reason for such a sentiment and feeling, going beyond the basic division between the attitude and approach of the two services, but then with his decade-long experience in a life without formal uniform 24X7 since, Field Marshal Gardihewa Sarath Chandralal Fonseka, RWP, RSP, VSV, USP, MP, rcds, psc, should have known, and known better!